We’re pleased to announce the winners of the 10th Annual ILTA Golf Tournament and the 11th Annual ILTA Tennis Tournament, both sponsored by Kraft Kennedy. Congratulations, winners! Did you win a Vendor Bingo prize? Completed vendor bingo cards were due by 10:30 a.m.
Peggy Wechsler starts the show. Among the prizes, iPods, Wiis, GPS systems, gift certificates, an Amazon Kindle and more. All prizes were generously donated by our wonderful vendors. Thanks, you guys! The first winner, Jack Hendricks, will take home a camera. 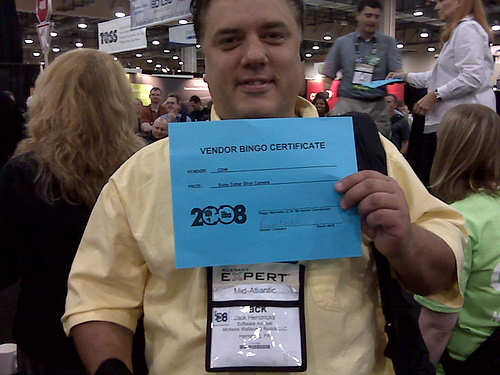 Vendor Bingo is ILTA’s popular game that attracts conference attendees to the Exhibit Hall. 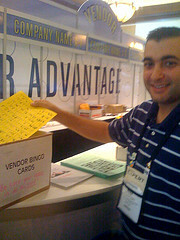 Each conference attendee is given a bingo card with a square corresponding to each exhibitor booth. Each exhibit booth is given a stamp to validate the bingo card. Conference attendees are encouraged to visit each booth to acquaint themselves with our exhibitors and get their card stamped. To get their card stamped, the attendee must answer two questions posed by each exhibiting company. 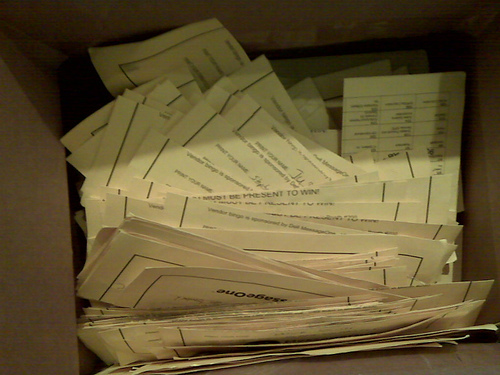 Bingo cards will be collected and screened for completeness on Thursday morning. 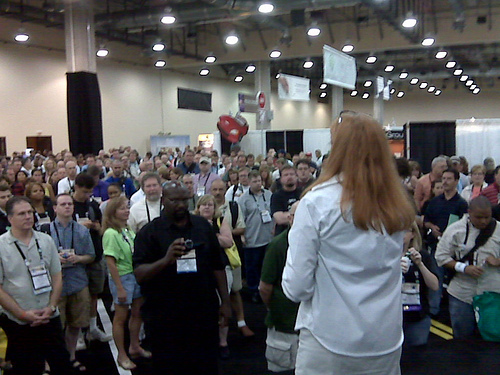 Attendees congregate in the Exhibit Hall for the drawing at 11:45 a.m. on Thursday. New this year: No vendor bingo at the Exhibit Hall Reception on Monday night. Use this time to get reacquainted with clients and to meet new friends. Bingo cards will be distributed Tuesday morning at the Exhibit Hall Grand Opening. Did we mention there are fabulous prizes to be won? More on that later. We’re finally in Grapevine, and we’re spending the weekend getting ready for you. 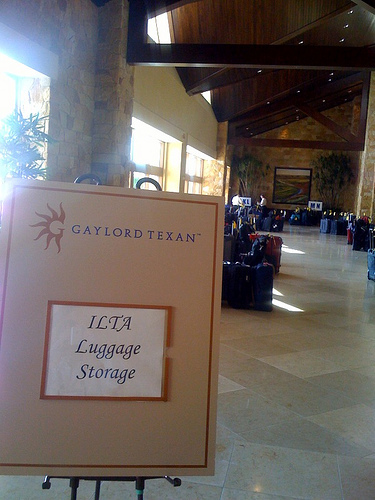 ILTA’s conference chairs, Bill Mertes and Michele Gossmeyer, together with the Board of Directors and other volunteer leaders are writing, sorting, stuffing, setting up and “ILTA-izing” the wonderful Gaylord, Texan. Check the “Share a ride” story to join someone from the airport to the hotel. The ride is no more than 15 minutes. Go through the FAQs for answers about what to bring, how to dress, registration, etc. Pick up an ILTA Globe with more information about sessions as well as regional and peer group networking events and vendor events. Looking for extra event tickets? Have an extra ticket you won’t be using? Just comment to the post (below) and connect with other ILTA ’08 conference attendees to give, receive or swap tickets. Keep looking here for updates before and throughout the conference. If you want to purchase additional event tickets outright, members and vendors can download and use the appropriate order form from from the conference website. Last year, ILTA conducted a survey of new attendees to determine how valuable the conference was to their profession. We asked them to identify their key expectations – those factors that led to their decision to attend; and we wanted their feedback immediately following conference on how those expectations were met. Then, we followed up with them three months later to see if additional value had been gained. Did they realize a return on their firm’s investment? Immediately after the show, 62 percent of first-time attendees said it exceeded or far exceeded their expectations for expanding their knowledge. Three months after the show, 80 percent of first-timers said it exceeded or far exceeded their expectations for expanding their knowledge across a broad area. And almost every first-time attendee was able to put that new knowledge to work on a current project. Learn more about the benefits of attending conference by downloading our value proposition.